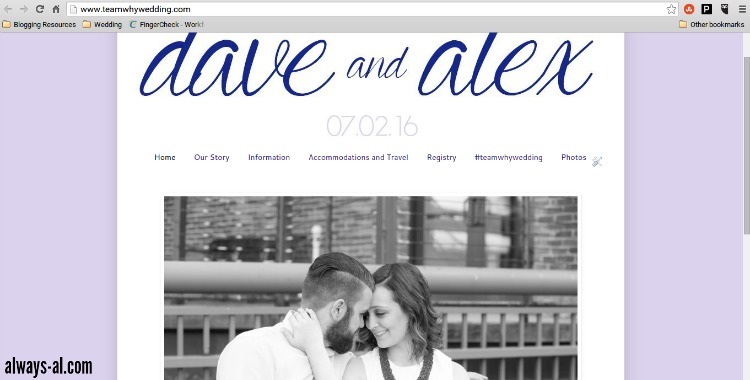 I think wedding websites are an amazing invention. You can find out what you should wear to the ceremony, where the couple is registered, and maybe even find out about the hotel block. When I was putting together our wedding website, I didn't go into it thinking I would make one. I checked out The Knot, and Wedding Wire, where you can create your own site for free. They had some beautiful options, and it seemed really easy to customize. ...But then I ran into some minor drawbacks. #1. You can only have access to your personal site for about a year. This was a problem for us, who have been engaged now for about a year and a half. I wanted to start working on it ahead of time, so that I wouldn't be working on it during our busy time at work. #2. None of the templates really felt like us. There were some really beautiful, elegant ones... but those just felt too fancy and formal for our occasion. And then there were some very rustic ones... but those felt a little too rustic. The only answer was for me to make one myself. I decided that I wanted a home page, and then separate pages to land off of that. I'm sure there is a lot of fancy coding that you can do to create this, but the easiest way that I found was to write one post, and use that as my home page. It features a main image, and a welcome note and that is all. All other information is located on pages, which are accessible through tabs. 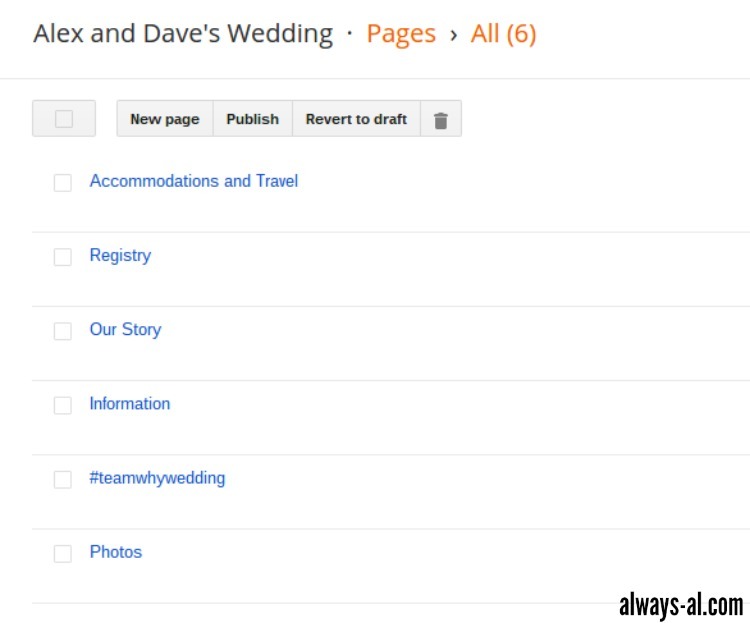 I have pages for Our Story, Information, Accomodations & Travel, Registry, our hashtag, and Photos. To make your pages (and home page) look more like static web pages, and less like blog posts, you should disable comments throughout. Whenever it was possible to disable a feature that allowed user interaction, or delete a feature that makes it appear more like a blog, I did. I created a header on PicMonkey using the same script font that we used on the save the dates, and uploaded it right to Blogger. Keeping the color scheme relevant and layout very simple was easy, and I did all of the design work right in the the Layout tab. I also created a "Y" favicon, just to add a little extra. I am absolutely thrilled with how the website turned out, and that I can say that I created it all by myself. I have been updating it as we go along (we still don't have a registry yet! ), and I love that I have control over the site itself. I would absolutely recommend to anyone who feels comfortable enough to DIY their own website to go for it. It is so worth it. Check it out for yourself! 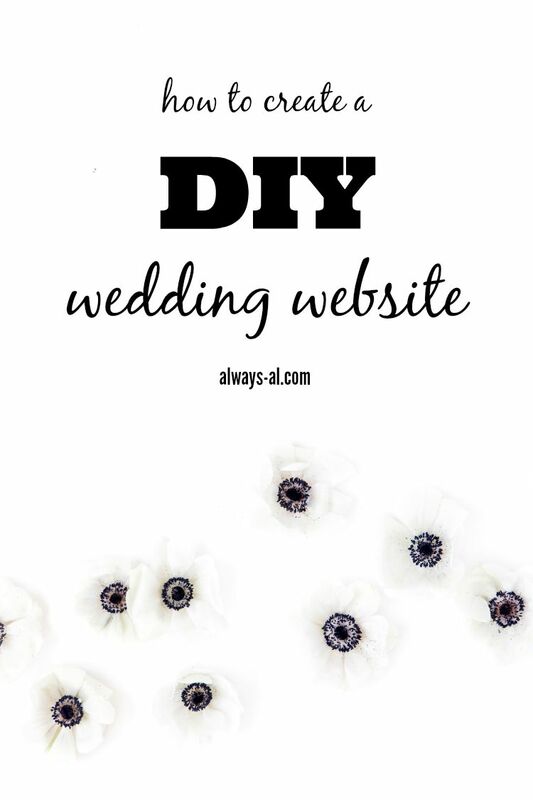 Would you ever think about going the DIY route for your wedding website? Linking up with Wedding Wednesday and Wine'd Down.